The Ryzen leaks just keep on coming! The latest of which gives us a glimpse into the gaming performance of AMD’s upcoming 8, 6 & 4 core CPUs. The new benchmarks are based around Futuremark’s popular 3DMark suite. Specifically, the physics test designed for CPUs. So without any further delay, let’s dig into the juicy details! 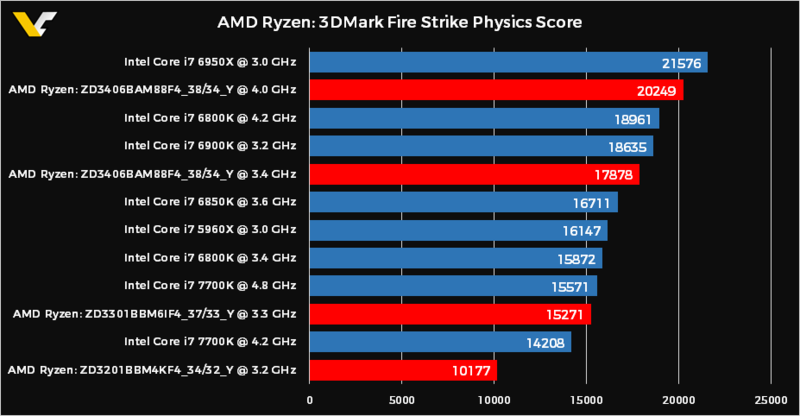 Two of the graphs below are courtesy of VCZ, who have managed to track down 3DMark physics scores for 8 , 6 and 4 cores Ryzen CPUs. Including a Ryzen 8 core, 16 thread CPU overclocked to 4.0GHz. These newly leaked benchmarks aren’t the first we’ve seen for Ryzen. 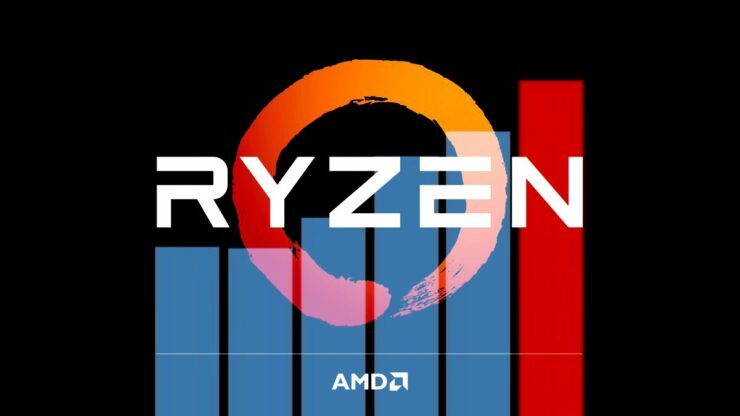 To check out the 8 other Ryzen CPU benchmarks that leaked just a couple of days ago make sure to to head over to our previous article where we break it all down here. Lets start with the multi-core overall physics score. The 8 core, 16 thread Ryzen CPU overclocked to 4.0GHz manages to outperform every single other CPU tested, except Intel’s 10 core $1700 i7 6950X. Running at stock clocks the CPU was within striking distance of the $1199 i7 6900K and held a two thousand point lead over the i7 5960X Haswell-E 8 core flagship. It should be noted that scores for the Intel chips in the above chart are borrowed from a Tom’s Hardware review and are 2000 points higher than the scores found on the official Futuremark database that the Ryzen scores are borrowed from. 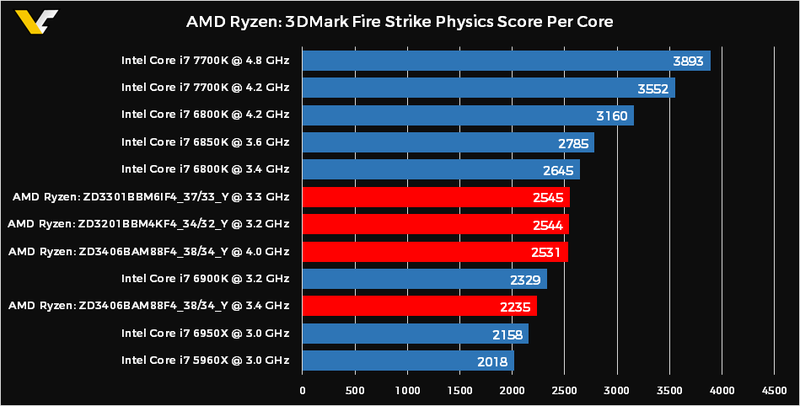 If we borrow the physics score for each Intel CPU from the same Futuremark list, Ryzen CPUs would outperform each of their Intel counterparts core for core and clock for clock. This brings us neatly to the second graph from VCZ which summarizes the performance per core for each chip. F or the above chart, physics scores were divided by the number of cores each CPU has. 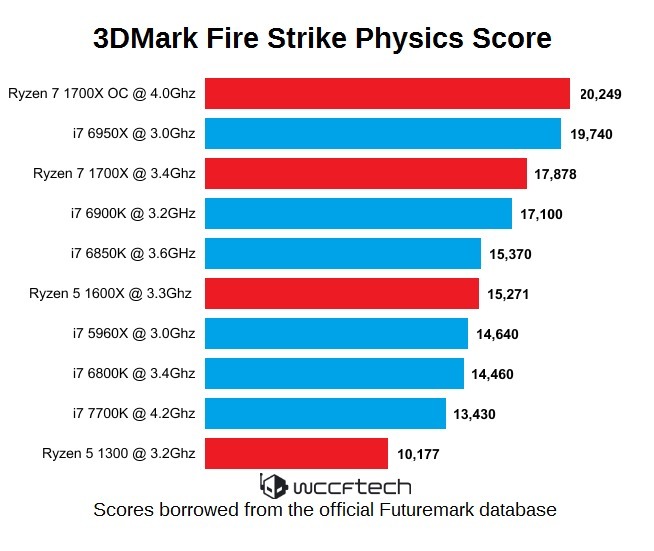 3DMark Fire Strike’s physics test clearly doesn’t scale perfectly with additional cores, which is why we see higher core count CPUs end up with slightly lower scores per core. Here we find both the overclocked and stock 8 core 16 thread Ryzen CPU coming in ahead of both of Intel’s Broadwell-E & Haswell-E Extreme Edition chips. Stock clocked 8 and 6 core Ryzens place within striking distance of their 8 and 6 core Intel Broadwell-E counterparts. That’s incredibly impressive performance overall. For chips that are up to three times less expensive than their Intel equivalents Ryzen’s performance per dollar stands uncontested .